Peerless-AV will be exhibiting its range of AV solutions at ISE 2019, Hall 12, Booth H90 from February 5-8, 2019. To schedule a booth interview, contact Beth Gard, [email protected]. Sunlight-readable displays (or high bright) are a core component of outdoor kiosks and self-service. Along with the enclosure and typically the PC, the high bright display is a main economic component and reliability is paramount. And that means in some very challenging environments. A parking lot unprotected in Dallas Texas in the summertime can get well over 130 degrees. Panelbrite is one of our members and is the premier outdoor display provider (along with Litemax). I personally have many years of experience with their products and I have never been disappointed, only pleased. Here is a background primer on Panelbrite with Keith Grapes. FAQ – What are NEMA ratings? One of the trends in 2018 is the emergence of the emergency kiosk. Typically it has the typical informational side to it but then it is just as capable serving as an emergency terminal. Education facilities including high schools, universities, junior and technical vocational schools. Anywhere where a large number of people are congregating which can be a retail mall location outdoor where people are walking around. Advanced features include automatic activation upon retrieval, voice and text use instructions, automated self-tests, etc. Emergency kiosk should be climate controlled, if necessary. connectivity to mobile Apps and devices to speed evacuation with safe route notification. We’ll include a couple of representative RFPs. 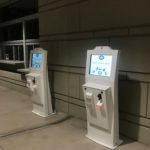 More and more uses are being developed for outdoor kiosks, but a successful deployment depends in large part on the vendor behind the project. Interactive kiosks have become commonplace in restaurants, retail stores, health care facilities and other locations. But as technology improves and new applications come along, kiosks are becoming an integral part of the outdoor environment as well. 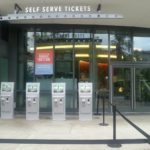 Opportunities for outdoor kiosk deployments include event ticketing, campus wayfinding and drive-through ordering, among others. Consumers today are increasingly pressed for time, and an outdoor kiosk can help provide the convenience they seek. It’s likely that as the technology develops, new and as-yet unheard-of uses will be found. But all kiosks aren’t created equal, and that’s particularly true when it comes to those designed for outdoor use. Not only can working with an experienced vendor go a long way to determining the project’s success, it can help protect a deployer from regulatory liability and unnecessary maintenance costs. Obviously, an outdoor kiosk should be designed from the ground up as a watertight enclosure, with watertight seams and insulated inner walls to protect internal components from heat and cold. In addition, a reputable vendor designs to UL guidelines to certify that the units are waterproof and safe to operate in rain or snow, and routinely implements UL testing on first prototypes for customers who require UL certification. Factors such as power, grounding and mounting are more significant factors with an outdoor kiosk than one located indoors, making adherence to UL guidelines of critical importance. 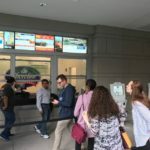 Outdoor kiosks also need to adhere to the same Americans with Disabilities Act guidelines as indoor units, ensuring accessibility for all users. Failing to do so exposes a deployer to fines and lawsuits that can run into many thousands of dollars. 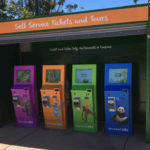 Olea Kiosks, for example, incorporated those concerns when it designed and built 56 ticketing kiosks that were deployed as part of a front gate renovation and new attraction opening at a major theme park. The ADA-compliant kiosks are used by thousands of visitors every day. To ensure they perform flawlessly over their intended 5- to 7-year lifespan in a variety of outdoor conditions, the kiosks included a custom interior air conditioning mount and 2” thick insulation to ensure low internal temperatures in an environment that can routinely exceed 100 degrees Fahrenheit. The enclosures were manufactured with powder-coated stainless steel and waterproof mounting points to protect from wet weather and eliminate the possibility of rust. But while those are the obvious concerns, Olea took additional steps to address issues that may not have been so apparent. The kiosks have a significant amount of artistic branding, allowing them to serve as decorative signage as well. The material used for the branding is designed to withstand fading, ensuring the devices look fresh and cutting-edge for years. 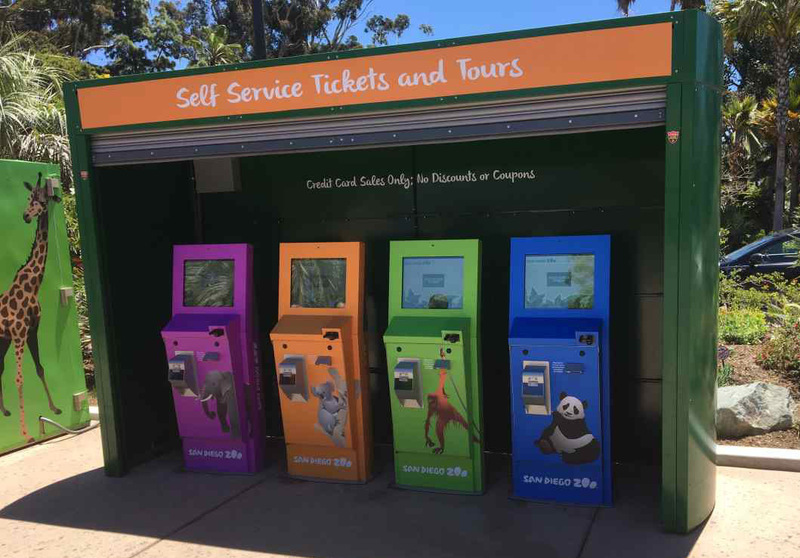 In addition, because the kiosks are placed in a high-traffic area outside of the park near a number of retail and restaurant locations, they include a removable front cover to protect the touchscreen during hours when the park is closed. 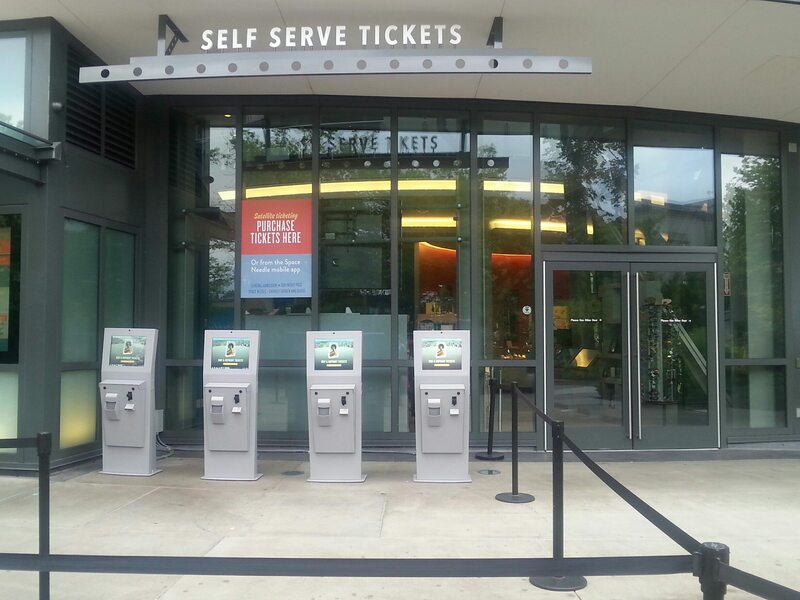 The features Olea has built into its outdoor ticketing kiosks are embodied in the Seattle model. The Seattle includes a 19-inch high-brightness touchscreen with top-tier components built to withstand all types of weather conditions. Temperature control systems and IP65-qualified rating make the Seattle perfect for hot and cold weather deployments. The Seattle also features a bolt-down base plate, allowing them to be securely mounted in places including sidewalks, parking lots and outside business entrances. Capabilities include ticket and wristband printing, payment acceptance including EMV components and barcode scanning. The Seattle is ideal for event ticket sales, concessions and ride entrances. Another area of growth for outdoor kiosks is the restaurant drive-thru lane. Combining the fact that a typical QSR does as much as 70 percent of its business at the drive-thru and self-order kiosks have been demonstrated to increase ticket averages by 10 percent or more, the marriage of fast-food drive-thru and self-order technology makes perfect sense. In addition to the ability to automate the suggested selling process, self-order kiosks offer easy customization or orders, helping to boost sales. Customers may also indulge in the occasional splurge free of guilt, knowing the kiosk won’t be critical of their meal choices. Fast food giant Wendy’s for example, has already rolled out kiosks at 300 of its stores with plans to add them to additional locations soon. Wendy’s CEO Todd Penegor told the investment news site TheStreet that locations with self-order kiosks are seeing higher average checks and customer satisfaction scores, likely a result of their ability to allow guests to customize their meals. “It’s a part of the future of eating out,” Penegor said. Olea’s entry into the drive-thru arena is its Detroit model. The Detroit includes a 32-inch sunlight-viewable touchscreen. (After all, who among us hasn’t used our hand as a shield so we can see an ATM or Redbox screen?) The multitouch touchscreen provides an ergonomic interaction — whether from a sports car or large SUV. The enclosure is designed to reduce power draw and includes options for custom branding and overhead signage. The devices can be installed as either freestanding units, two-sided or in-wall, column or post mounts. They also include presence detection to “wake up” the units when customers approach and marine-grade stereo speakers for communication with staff. 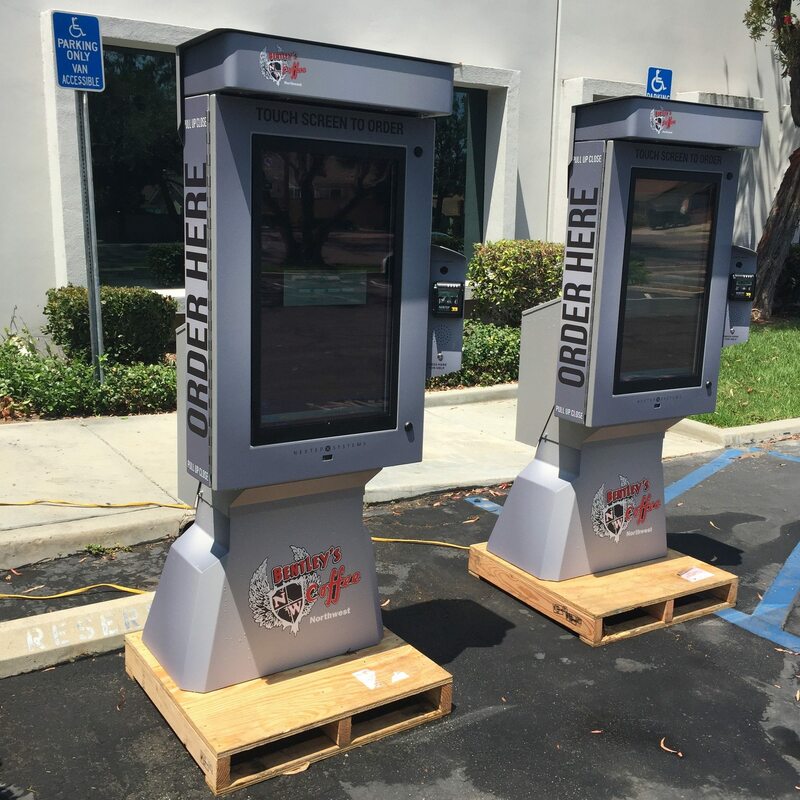 One major national sandwich chain has seen their drive-thru sales increase by 15 percent at locations where they have deployed an Olea drive-thru kiosk. Not all deployment locations are the same. Businesses are becoming increasingly aware of how their customers move through a location, and to maximize revenue they must be prepared to serve their customers wherever they may be. Kiosks can help optimize those transactions whether they take place inside the venue, just outside the front door or in the drive-thru lane. Olea kiosks can be designed to withstand any environment, from summer in Arizona to winter in Minnesota. The company’s engineers have options for solid-state heating and cooling systems to complete HVAC systems designed specifically for kiosks. 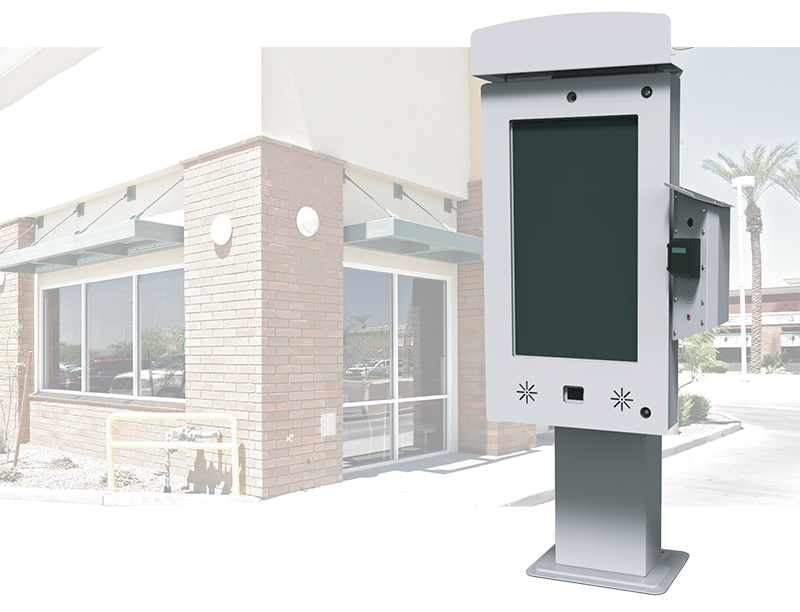 Olea’s outdoor kiosks come with monitors from 8” to 84” or larger and can include payment, printers, solar, wireless and just about any other equipment that can be put into an indoor kiosk. The company uses only the most durable stainless steel and aluminum for its outdoor kiosks, running each through a multistage painting and plating processes. 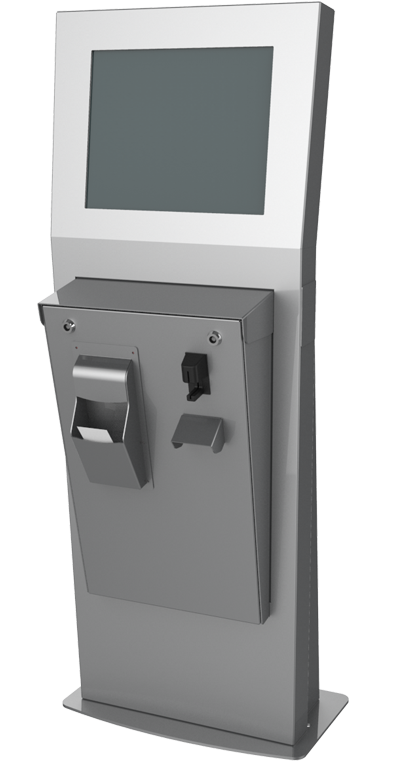 Olea kiosks also feature automotive-style gaskets, compression-style locks, and unlike some galvanized electroplating and more, all to ensure an Olea outdoor kiosk will last as long and be a trouble-free as any indoor kiosk. There are hundreds of applications suitable for an outdoor kiosk, and more are being developed every day. 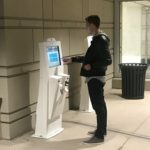 The best way to implement a successful outdoor kiosk deployment is to work with a vendor who is experienced in those deployments and has a track record of success. Olea Kiosks stands ready to help. A kiosk that faces either east or west is likely to have its screen in direct sunlight for at least part of the day. Facing the kiosk either north or south could enhance visibility. Enclosures should be designed without seams and cracks that could serve as entry points for screwdrivers or crowbars, as well as dust and insects. Deployers of smart city kiosks need to carefully consider the implications of including Internet browsing capabilities. When New York initially deployed its LinkNYC smart city kiosks, some people hogged the devices while surfing the Web, even pulling up chairs. Others used them to visit “inappropriate” sites. Outdoor kiosks need to comply with regulations under the Americans with Disabilities Act. Failing to do so could lead to fines that run into the thousands of dollars. North Sterling State Park has a new feature to make it easier for visitors to purchase a parks pass. The park is one of eight state parks to receive a new self-service kiosk so far. These outdoor kiosks are also solar kiosks and provide ticketing and registration via 3G/4G modem. “Not a lot of people have exactly seven dollars [for a daily park pass] in their pockets,” said CPW Statewide Business Operations Coordinator Kirk Teklits. “As far as customer service goes, being able to pay by credit card is definitely a desirable service option. 15 stations are currently installed at nine parks and more will be coming later this summer. 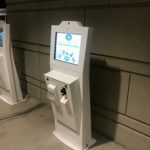 Teklits said there have already been more than 800 daily passes and 55 annual passes sold through the kiosks since the first ones were installed June 13. The kiosks accept Visa, Mastercard and Discover cards. We asked for some more background information on the outdoor kiosks and learned deployment began in June 2018 with 15 stations. And already the other parks have requested their own solar kiosks. Business at the kiosks has been very good so far and expanding to all the parks in Colorado is just a matter of time (and money). Each kiosk costs around $6K is our estimate and looking at the kiosks it looks like Parkeon is the vendor. They have a 3 year contract we are guessing. The original RFP went out last quarter of 2017. That’s 8 months from spec to deployed. Connectivity is managed thru a 3G/4G modem. For more on Outdoor Kiosks see our reference page on Outdoor kiosks. This special webinar training focuses on the two types of outdoor displays offered by Peerless-AV. The webinar will cover the Xtreme™ outdoor display, which is fully weather proof and impact resistant, making is perfect for commercial applications. The webinar will also feature the UltraView™ outdoor TV, which is perfect for residential and light commercial applications. There has never been an outdoor daylight readable display built to withstand the harsh outdoor elements like the Peerless-AV® Xtreme™. The fully-sealed weatherproof design provides the ultimate protection, while the patented Dynamic Thermal Transfer™ system passively cools and thermally heats the display eliminating the need for filters, vents or fans. With the highest water and dust ingress protection ratings in its class, the Xtreme display is a perfect choice for any indoor or outdoor location. For more information on Outdoor see Outdoor Kiosks here on KI. Enclosure cooling and heating news from ThermoElectric Cooling America (TECA) Corporation. We love listening to customers’ needs and pushing the limits of our designs. This is how we innovate . An industry-first, unprecedented 4+ SQUARE FOOT plate surface! 28.00 x 28.65 inch work surface. Useful in laboratory, manufacturing, and quality control processes, the AHP-5400CPV Cold/Hot Plate is as versatile as it is large. Offering 1,380 watts cooling capacity, the plate size can impressively handle multiple microplates, product materials or other samples. Customize it for your needs with available accessories. The largest of its kind, our customers’ needs inspired the size and design of the AHP-5400CPV — a great example of TECA’s customer service & product innovation. Cool, Heat, Stir & Soak Samples. tecaLOG software for the end user to monitor temperature, adjust the set point, and tune the controller to enclosure specific requirements. Our purpose at TECA is to provide best-in-class products to meet and exceed our customers’ needs. Falcon Analytical and TECA Corp. collaborated to find a suitable solution in a hazardous environment. By incorporating thermoelectric air conditioners from TECA into the Calidus Ultra Fast Gas Chromatography system, plant on-site installation became more economical. Falcon Analytical Calidus Ultra Fast system. Falcon Analytical is an OEM specializing in gas chromatography solutions. Our through mounted units intrude into the enclosure a few inches. When installed properly, a closed loop system is created. There is no exchange of ambient air and enclosure air. TECA includes proper mounting hardware and environmental gaskets with all air conditioners. The AHP-1800 Series Air Conditioner is offered in a variety of configurations. Falcon Analytical uses TECA Corporation’s AHP-1801XPHC-1 Air Conditioners to enable safe installation of their Calidus Ultrafast Gas Chromatography system into hazardous locations. Some gas chromatography installations require NEC saftey ratings CID2, Groups A-D . TECA’s AHP-1801XPHC-1 Air Conditioner meets the safety requirements of all four Groups. Because TECA’s AHP-1801XPHC-1 air conditioner is rated for these environments, Falcon Analytical is able to use simple Z-Purge or X-Purge devices to make the whole enclosure safe for installations in: Refining, Petrochemical, Upstream, and other operations requiring such safety ratings. The AHP-1801XPHC-1 offers plenty of capacity to handle the most demanding locations such as the Texas Gulf Coast and even Alberta, CA. In the photos above, note the plant installation where 3 Calidus Process Enclosures are shown. The AHP-1801XPHC-1 units are bottom mounted into each analyzer enclosure. The TECA units have been in operation in Falcon Analytical’s system for more than 4 years without maintenance or downtime. This is a testament to the capability and capacity of the TECA air conditioner in a tough environment. The design of the Process Analyzer Enclosure allows far more economical plant installations because no climate controlled shelter is required even in very cold or very hot environments. Using TECA Model AHP-1801XPHC-1, simply protecting the Process Analyzer Enclosure from direct sunlight and precipitation is enough. TECA thermoelectric enclosure coolers are built to endure. We use top quality heat sinks, military grade fans and we design and manufacture all our products in the U.S.A.
Fun Fact: Mr. Peltier’s headstone is a tourist site in Ham, France. Jean Peltier’s legacy is the Peltier effect -the discovery of heat transfer when voltage is applied to dissimilar semiconductor materials (generally termed thermoelectric effect ) . He was born on February 22, 1785. Nearly 200 years later, TECA Corp. was established and we were the first to marketthermoelectric enclosure coolers. Trust our decades of experience and please consider TECA products for your upcoming projects. Contact us today! We look forward to assisting you. ve occurred and here is compendium of all the latest news for Turnkey Kiosks. Click to Continue button to toggle thru the releases. Turnkey Kiosks developed the world’s only, patent pending, Laser Printer Extended Transport that can turn any laser printer into a kiosk printer. IBM has adopted 70 units for use at the AZ MVD Self Service Kiosks. The Transport is powered independently of the printer. Contact Gary at Turnkey Kiosks, www.turnkeykiosks.com if you have any questions about any of the above information. Kiosk components require specific temperature ranges for reliable, optimal performance. Although any TECA air conditioner can be installed in a kiosk, TECA now offers a complete line of thermoelectric air conditioners designed specifically for kiosk and OEM applications. The product line spans from 155-1,270 BTU/hr and is suitable for indoor or outdoor kiosks. Each cooler has a unique internal-mount design. There is no extrusion into the ambient environment. These enclosure coolers are ideal solutions for situations where either physical space or aesthetic considerations will not allow protrusion of thermal equipment. For cold environments, heat/cool designs are available. Customization is available. Thermoelectric cooling is a reliable and maintenance free way to protect electronics and equipment. Very nice drive-thru order kiosk from Nextep Systems. Excerpt: The DT5 integrates seamlessly with the rest of NEXTEP’s product suite, including POS and mobile ordering. With bold graphics and a clean interface, our POS lets restaurant employees see orders in real-time and process those orders intuitively, thereby speeding up operations. Additionally, guests can order from their mobile devices and use the DT5 to tell the restaurant that they have arrived to pick up their orders. Watch “Equalizing the Drive Thru” and See how the Touchscreen Drive Thru makes the ordering experience identical for the Deaf and Hard of Hearing and any other guest, truly eliminating any stigma or discrimination. Equalizing the Drive Thru from NEXTEP SYSTEMS on Vimeo. The city is finally kicking into gear its plan to convert the abundant supply of defunct payphones into Wi-Fi hot spots. A Verge contributor spotted one of the helpful technology boxes being installed on the corner of West 15th Street and Third Avenue this morning, meaning the city is making good on its promise to begin delivering the 7,500 kiosks that will give users access to free Wi-Fi, charging stations, a touch-screen panel loaded with information like city services and directions, and allow them to make free domestic calls (albeit on speaker phone) before the end of 2015. According to The Verge, hundreds of other hubs will be installed throughout the city in the days to come, meaning free Wi-Fi for all!—or at least all of those standing within 150 feet of a hub. The kiosk, formally known as LinkNYC, was born out of Bloomberg-era design competition Reinvent Payphones and has, unsurprisingly,garnered a lot of criticism, as most things affecting New York City do. The brunt of that was centered around the unequal distribution of kiosks throughout New York City, but the issue was laid to rest after more than 400 planned kiosks were moved out of Manhattan and into the outer boroughs. The kiosks will also have two 55-inch advertising displays that the city estimates will help generate $500 million in revenue over the next 12 years. Here are a couple of pics of units in the field by Olea. The UK’s only conference and exhibition completely dedicated to the self-service industry returns to The Barbican Centre on the 15th-16th October 2014. This will be the show’s fourth year and with all of the U.K’s leading solutions providers exhibiting this year, it is promising to be an exciting event. Co-located with Digital Signage London, the show acts as the central meeting point for strategic customer service mangers, managing directors, VPs, Marketing and brand managers, kiosk and self-service project managers, purchasers and heads of IT responsible for the implementation self-service solutions and technologies throughout the UK. KIOSK LONDON EXPO will return to The Barbican in London on the 15th and 16th October 2014. This will mark the shows fourth year and reflects its status as the favoured event for all those responsible for the implementation of self-service solutions and technologes throughout the UK, Europe and beyond. This year, for the second time, the show will be co-located with DIGITAL SIGNAGE LONDON, providing a unique opportunity to discover the best that the consumer interactivity industry has to offer, from the comfort and convenience of London’s Barbican Centre. KIOSK LONDON EXPO 2014 and DIGITAL SIGNAGE LONDON 2014 is the United Kingdom’s combined self-service and digital signage event. With a high number of self-service and digital signage solutions companies exhibiting this year, it is promising to be an insightful and exciting event. The show acts as the central meeting point for strategic customer service managers, managing directors, VPs, marketing and brand managers, purchasers and heads of IT responsible for the implementation of self-service solutions and technologies. “The UK is at the forefront of self-service and digital signage deployment,” commented Jens Schindler, managing director, hf media & events. “KIOSK LONDON EXPO 2014 and DIGITAL SIGNAGE LONDON 2014 will provide an unparalleled platform to showcase the latest advances in customer service solutions from top suppliers and innovators, bringing the industry together and strengthening the UK’s self-service and digital signage market.” Preregistrations include well-known managing directors and decision makers from the UK’s top retail brands, leading high street banks, transportation firms, hospitality companies, fast food retailers and healthcare providers. Visitors will have a unique opportunity to see, experience and discuss the very latest advances in customer service solutions from top suppliers and innovators from Britain and beyond. There will be a forum programme featuring an extensive series of presentations, all of which are free to attend. These presnetantion will explore a wide variety of issues relating to self-service and digital signage including some you will probably not have thought about before. The forum has attracted some of the industry’s most influential and authoritative speakers. The full programme is available online at www.kiosklondon.co.uk and www. digitalsignagelondon.co.uk. “Kiosk London Expo provides Star with an excellent platform to demonstrate its extensive portfolio of industry-leading products, advanced driver and platform support for mPOS applications and pioneering approach to a wide range of high quality end users and system integrators. With an ever increasing number of relevant visitors each year, Kiosk London is clearly going from strength to strength. We look forward to another successful show this year.”, said Annette Tarlton, Marketing Director, Star Micronics EMEA. Customer service – customer service is key to repeat sales and customer satisfaction. The event will feature Kiosk and digital signage technology built to improve and satisfy the customer experience. Influential speakers – this year we have some well known influential speakers keeping you up to date with the best advances in technology and an insight into what customers really want. Along the way, you’ll get to explore a wide variety of issues relating to self-service and digital signage markets. Topics to be covered include multi-channel retailing and the effect of a digital culture on consumers. Networking – connect with industry professionals, share knowledge and make new business contacts. Interactive technology – experience the latest advances in interactive consumer technology for yourself. Free consultancy – discuss your business plans informally with experienced professionals. Your technical questions answered – informed technical support is a key reason for attendance. Future-proofing your technology – gain a better understanding of what is on the technology horizon, and discuss the opportunities they offer your business in the future. Understanding capex, opex and ROI issues – with the financial imperative now firmly installed at the boardroom level, there has never been a better time to get a better grasp on these accounting issues. Understanding convergence – technology is evolving rapidly. As a result, previously disparate businesses are now converging on the technical level. This show will help you gain a solid understanding of how these issues affect you and your business. To successfully deploy digital displays in outdoor environments, many factors must be considered. With indoor environments, everything is nice and comfortable. It does not rain inside, temperatures and humidity are controlled, the sun does not shine indoors, ambient light conditions do not change, the air is clean, power is consistent, the wind does not blow and vandalism is rare. Basically, digital displays that are deployed indoors are in a controlled environment in virtually every respect. The table above shows just what severe conditions outdoor digital displays have to endure. They must be built to withstand direct sunlight, extreme temperatures and humidity, rain, snow, dust and dirt, harsh windy conditions and also be protected from vandalism. It’s imperative to keep all of the above factors in mind when evaluating outdoor displays. But, now that I’ve covered the range of considerations that must be thought over prior to purchasing and installing outdoor displays, let’s take a deeper dive into one specific factor – the impact of the sun. Solar Clearing of the LCD screen is a concern. With direct sunlight, the LCD crystals could go through a phase change and cause black blotches on the screen. Some LCDs are rated at 68°C, others 80°C and some at 110°C. The higher rating, the better. Solar Clearing will reduce the operating life of the displays. CCFLs are not recommended for outdoors. Only use LED backlight systems. Avoid digital displays that are optically bonded to cover glass. The sun is worse in winter with clear skies/lower haze. Employ ambient light sensors to automatically adjust brightness based on light conditions. East/West orientations are worst. North/South orientations are best. Rising and setting sun are the worst times of the day, not high noon. There is a great deal to consider when thinking of how the sun alone will impact outdoor displays. But also consider the following when it comes to the impact of temperature and humidity on outside digital displays. Be designed for temperatures down to – 20°F and over 110°F. Be designed to be based for high temperatures and direct sun load. Have a display that is “sealed” to prevent condensation forming inside the cover glass. Have embedded electronics (player, modem, etc.) that are rated for internal display temperatures. Have a plan for cooling. Conventional A/C systems will drip, require maintainance and consume significant power. Consider alternative cooling methods. Be prepared for how temperature fluctuations can affect brightness. While the considerations related to sun, temperature and humidity may seem overwhelming, once they are factored into your outdoor display purchase and deployment, you can rest easier knowing you have taken every precaution to protect your investment. Beyond environmental conditions, also mull over installation, operational and service conditions. Are there any city/state permits required? Does the mounting need to be certified by a Professional Engineer? Must design digital display AND mounting structure for wind loads. Have you thought about Gail winds, hurricane force? Are Unions/safety personal required for installation or for service? How is power to be run to the unit? How is connectivity to be achieved? Consider 3G Modem/Antenna. What is the cellular service like for the area? What are the restrictions relative to full-motion video content? What are the restrictions relative to type of transition, frequency of transition? What are the codes/requirements for auto-dimming/shut-down at night? What power is available? Consider displays with a universal power supply of 85 V to 265 V.
Who will be paying for power? Outdoor displays consume three to five times more power than indoor. Consider brown-out conditions in summer. Current draw will spike and may trip breakers. Most outdoor displays run 18-24 hours/day. Is your display designed for this duty cycle? If unit is to be “turned-off” at night, consider just turning off backlights and not entire display. Glass should be separate from LCD screen. That way you can replace glass without replacing LCD. Can the digital display be serviced in the “installed” position? How easy is the service and will repairmen be working in outdoor conditions (cold, rain, wind-blown dust)? How modular are the replacement components? How intelligent is the display? Can it verify that the image is being displayed on the screen? Can the display report back to the NOC operational data and alerts? Can the display be controlled and updated remotely? Can the embedded player, 3G modem and switch be automatically or remotely re-booted? Provisions for mini-UPS system so unit can “phone home” if it experiences a failure? What is the “sealing” rating of the display? NEMA 3, IP 65, etc. Will it be washed down? How is the unit protected from insects, rodents? Does the paint finish provide protection against harmful UV rays over time? Some cities do not allow for full-motion video, while some cities do. Also, cities may only allow for digital static ads and then they may or may not allow for transitions from one ad to another. If your area allows for digital static ads, then you may only be allowed to change the ad every 10-15 seconds or 30 seconds. Some cities do not allow for the digital side to be facing traffic, like a Bus Shelter application. It has to be opposite the traffic flow as to not distract drivers. Many cities have nighttime restrictions requiring the display to be dimmed down at night or turned completely off after 11 p.m. Though there are many considerations and questions that come with properly deploying outdoor high-bright digital displays, the benefits of reaching the OOH (Out Of Home) marketplace are significant. It’s worth the time and thought to carry out your deployment after taking all points suggested here into consideration. True outdoor digital displays are NOT re-packaged indoor displays. The sun is the #1 enemy of Digital Displays. Common failure points include overheating, solar clearing, fading brightness and insufficient power. RevelSystems has promised up a picture of the installed unit. Stop back by and see it. SAN FRANCISCO, May 28, 2014 /PRNewswire/ –? ?Revel Systems, the leading iPad point of sale platform, has launched its iPad POS system for drive-through. This expands Revel Systems’ product offering for fast food and enterprise-level clients, providing them with a fu…..
San Francisco, Calif. – May 28, 2014 – Revel Systems, the leading iPad point of sale platform, has launched its iPad POS system for drive-through. This expands Revel Systems’ product offering for fast food and enterprise-level clients, providing them with a fully integrated video chat experience with their fast tablet-based POS system. In the years since the drive-through was first invented, it’s hardly been innovated. The user experience has always been mediocre and impersonal. In the age of the customer where customer experience trumps all, drive-throughs are next on the horizon for a radical change. The latest revolution from Revel will allow for a more human experience while maintaining accuracy and efficiency for both the merchant and customer. The Video Drive-Through POS operates with three iPad devices, including Revel’s QSR iPad POS terminal. This enables seamless drive-through functionality and allows guests an engaging and easy way to order their food. Patrons simply pull up to an embedded iPad in the drive-through sign and order their meal by speaking to the POS operator via a video feed. Both the operator and customer can see each in the video chat window, and orders appear in the customer facing iPad display by the vehicle in split screen. When finished, the customer pulls up to the second window, where they can meet the operator in person, and pay. There will also be an option to pay and sign at the point of ordering, thus cutting drive-through wait times in half. This new innovation not only deeply personalizes and modernizes the experience, but also cuts costs down for businesses operating a drive-through. The drive-through application works together with the Revel iPad POS, and is being offered as its own separate app. The drive-through POS requires a total of three iPads to operate–one for the client-facing video feed, one for the employee-facing feed, and another for the main iPad POS terminal. Additionally, a metal sensor detects when a car pulls up so that the system is not reliant on optical sensors alone. As opposed to traditional drive-through models, it allows for a seamless face-to-face interaction between the customer and the employee, and a clear indication of what is being ordered.